Anubi was formed in 1992 in the city of Kaunas which is situated on the confluence of River Neman and Neris in the middle of Lithuania. Anubi. When I say this word, I associate it with the Egyptian god of mummification and embalming, widely known as Anubis or Inpu. Conclusion to this; the lyrics – although spoken in Lithuanian – are about death-related themes and mythology. The logo of the band compromises three things: a pentagram, an inverted ankh-cross which functions as a ”standard”, Christian inverted cross at the first sight. There are also two horns which can symbolize the Devil. However, it can be a reference to the coat of arms of Kaunas as well – and let me say that this meaning would be the nicest thing I’ve ever seen in the world of symbols of bands. Seeing the cover, an avantgarde movement comes to my mind, and its name is expressionism. The whole artwork deals with elementally strong colors, thoughts and emotions. On the front you can see a land with pine trees and with the shining white moon over the blood-red sky. This is definitely not the first thing you will notice. The first one you will surely realize is the presence of Death on the cover holding the eyes of the Moon in his hands; the album title is generally translated to ”When the Death shalt close the eyes of the Full-Moon”. And listen; it’s quite hard to recognize but yes, there is Anubis next to the Grim Reaper. On the back there is the Hooded again with a bird – probably a raven or a crow standing on his shoulder. Inside the booklet there is a larger painting showing Death again with his infamous scythe in front of a blue and purple dominated scene. Beside this, there are various drawings inside it. The reasons I am telling you all is to inform you about the concrete details giving an overall picture. And the more important one is that Lord Ominous – the vocalist, the personification of the creative force behind the band actually created the whole artwork. This is a sort of rarity in today’s world. However, beside the fact that Lord Ominous was a talented ”inter-artist” (he painted lots of pictures), it also signals that the album and the artwork is fully created with devotion. The CD contains 11 movements. The average length of each song is around 4-5 minutes, although there is Folklorine Daina Apie Mirti which not even reaches the 1 minute-length. To contrast this; the ending Tarp Akmens ir Veidrodžio is over 15 minutes! The intro-like first song arrives with church organs giving it a gothic feeling but as the vocals appear the gothic atmosphere is already gone. Saxophone and disharmonic melodies accompany the Lithuanian chanting. The title song, Kai Pilnaties Akis Užmerks Mirtis starts with minimalistic riffs at a mid-tempo. Quickly the keys approaching with rhythms and melodies which seem to be amusingly spontaneous at the first time. The piano reminds me of the music of Antheil and Poulenc. The vocals are both clean and harshly growled, the latters are filled with rage, and the formers are similar to a priest doing a ceremony. Later we become ear witnesses of a bass solo. 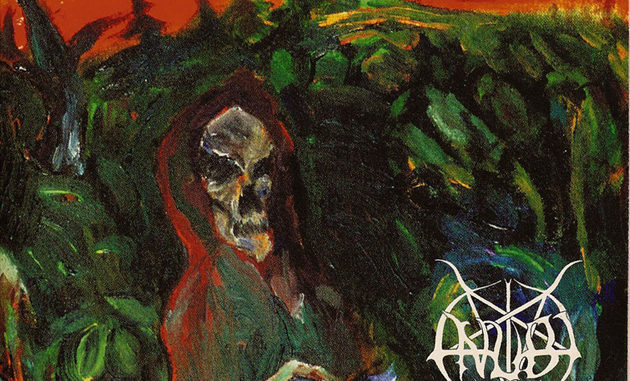 This album is often considered to be a post-black metal album. But when I say post-black metal I think of speed and harsh, technical things. In this case it is much more; the CD is full of surprises. One of the these is the medieval feeling created by bass guitar playing. This (the medieval atmosphere), contrary to the overall production; is not a rare thing seeing the hordes of black metal bands trying to resurrect the values and spirits of the » dark medieval times «. At this point, an Italian band came to my mind, one of my personal favorites: Evol. They were clearly a unique spot in the medieval/atmospherical black metal genre. Anyway, they didn’t use saxophones. But Anubi did. Before you think of some grand saxo-solo or anything, let me make one thing clear: although saxo is often used, the band managed to play effects and ambient-like sounds rather than some saxo-king-black-warrior wannabe production which would have been surely annoying. It would have destroyed the ”Anubi spirit”. The next surprises are the funky, tube-sounding key solos summoning a tropical feeling for a moment. Folky violin comes with the almost tribal-like drum playing and the singing of the wise Elder. I see everything when I close my eyes; the blazing camp fire surrounded with elders, the pine trees surrounding them, the black sky with the white, shining moon surrounding everything. This is the vision Kai Pilnaties Akis Užmerks Mirtis II. gives me. After this dream the next song, Gyvenimo Kritima Dovanosim Krankliui might scare you away with the bursting shriek in the beginning. But if you don’t listen to it, you will miss the somewhat psychedelic guitars that can be heard in this track. The keys are tinkling under the clean singing. Surprise after surprise; the symphonic arrangements of I Nauja Galybe make the song deeply filled with emotions. Ultra light, minimal guitars open the next chapter sounding so elegantly with the soft keys; the whole Ir Saule Neteko Savo Puses Veido is much closer to an ambient influenced post-rock song than anything else. This is not post-black metal anymore and I’m glad to experience it. My words don’t represent anything, one must listen to it and devote himself to this sophisticated perfection. Too bad that every good thing lasts for a few moments – we can say. The case of this great avantgarde band is not exclusion. Like stars on the night-sky, Anubi’s name is on the dead band’s list. The reason is filled with pain and sorrow. Lord Ominous, known as Martynas Meškauskas in the civil life died in a sailing accident on Lake Michigan on the 30th of March, 2002 with the age of 28. 04 – Kai Pilnaties Akis Užmerks Mirtis II.